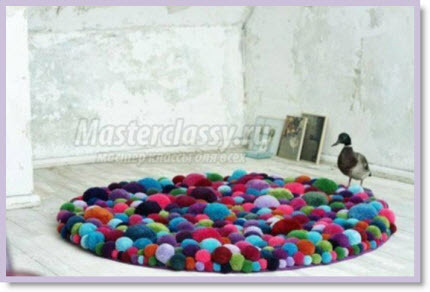 I have posted about mats made with felted balls, but this is made from wool pom-poms shown on the Russian site “Master Classy” and it is so appealing with its high-low pom-poms. Make your home warm and cozy with a “Stylish mat of bright pom-poms” complementing the interior décor and I love the natural room it is displayed in. You will find everyone will want to lay or set on this because it looks so darn inviting. They show how-to tutorial on making pom-poms using cardboard or buy a pom-pom maker. As a base I think it would be a good idea to use a low profile round or oval nonskid inexpensive readymade bathroom rug. Give one a try, too lovely. Like “Handmade” (Master Classy) on Facebook and see what they have next and tell them you found them on Craft Gossip. how do you change it to english? Their facebook page and web-site are both in Russian. I can usually make words out to figure out how to change the language but Russian, lol no way.